Two caterpillars were conversing when a beautiful butterfly floated by. The one caterpillar, staring at the butterfly, said to the other: ‘‘you will never catch me on one of those butterfly things’’ - Scott Simmerman (1999). The management of change is an important discipline in today’s ever changing business environment. Change is never easy, and managing it in a large corporate environment is even more challenging. This article is based on a research report that was conducted in 2004 and deals with the management of change in a large South African banking institution. The implementation of change through the communication of the vision. Based on the relevant literature, change can only be effectively implemented through proper planning and communication. The results of the research, has indicated that for the most part, the change process was adequately managed by the bank. This would more than likely be the case in most corporate transformation exercises. As was the case within this bank, some focus is still needed in creating a vision for the intended change and obtaining commitment from all employees. This means that senior management needs to ensure that the vision of the business unit drives the change, to overcome any resistance to the transformation. When focusing on the implementation of the change process, more effort could have been directed at communicating more regularly and taking steps to ensure that all employees are ‘’on board’’ and feel motivated to change. Providing plenty of communication messages, focused on what the change would entail for all stakeholders going forward. Understanding and managing change is very beneficial to leaders and project managers in order for them to manage projects effectively. According to John Kotter (1996), most credible evidence suggests that change will happen at a more rapid pace in the business environment in the future. Kotter states that the rate of environmental movement will increase and pressures on organisations to transform themselves will grow over the next few decades. He suggests that if this is the case, that the only rational solution is to learn more about what creates successful change. Do South African companies, in fact, use formal change management techniques to ensure the success of change initiatives? Secondly to make a few recommendations in terms of managing transformations based on relevant and credible literature. It will attempt to explain why change management should be considered as an important discipline in the South African business environment, specifically relating to managing projects. The study regarding the management of change was undertaken within a large South African banking institution using formal research methodology. The Branch Banking Unit studied serves as a retail delivery channel to the bank’s customer base, through which products are sold and serviced. Specific focus was placed on the approximately 400 service centre employees directly affected by the alignment project. This business unit forms part of a bigger Financial Services Group. Their strategy includes dividing the company into various business units, each operating independently and autonomously, to provide a comprehensive range of products and services to a specific target market. It also proposes the merger of various businesses, to unlock the benefits of size (larger balance sheet, greater marketplace credibility, numerous synergies across various customer bases) without losing their competitive edge achieved through their focus. Very importantly, provides the results of the research study with some recommendations in terms of managing change. The task of change management, which refers to the task of managing change in a planned and managed fashion. An area of professional practice where many consultants internationally, profess to specialise in managing change on behalf of clients. A body of knowledge, which consists of models, methods and techniques, tools, skills and other forms of knowledge that go into making up a practice. McKee (1998) provides an interesting insight into change management by reflecting on the difference between change and transition. He states that changes are successfully made by organisations, but they fail in the process of transition. Change is physical, like moving from point A to point B, but transition is a psychological process that people need to go through to come to terms with the new situation and this takes time. Transition starts with an ending. For people to successfully make a change, they must leave the past. Transition, as an inward psychological process, happens much more slowly than the outward physical change. McKee states that unless transition takes place, change will not work. Given the definitions of change management, research with hundreds of project teams, however, has shown that a one-size-fits-all approach to change management is not sufficient. To be effective at leading change, companies will need to customise and scale their change management efforts, based on the unique characteristics of the change and the attributes of the impacted organisation (Change Management Learning Centre, 2004). 1. Creating a sense of urgency - Change in an organisation does not happen in a vacuum. If nothing happened to disturb organisational life, change would be very slow and perhaps, merely accidental (Senior, 1997). Establishing a sense of urgency is crucial to gaining the needed co-operation to bring about change. Employees at all levels within the organisation need to be aware of the forces driving change, and need to be motivated to undertake change that will impact on their personal and working environment. 2. Building a strong guiding coalition - Because major change is so difficult to accomplish, a powerful force is required to sustain the process (Kotter, 1996). A strong guiding coalition is always needed - one with the right composition, level of trust and shared objectives. The kind of leadership that needs to be present with major change efforts is transformational leadership. Transformational leadership is where leaders are agents of change (McShane and Von Glinlow, 2000). These leaders develop a vision for the organisation, inspire and collectively bond the employees to that vision and gives them a ‘’can do’’ attitude that makes the vision achievable. Transformational leaders energize and direct employees to a new set of corporate values and behaviours. The elements of transformational leadership are provided in Figure 1. Figure 1: Elements of Transformational Leadership (Source: Heskett, J.L, Sasser, W.E, Schlesinger, L.A. (1997): The Service-Profit Chain, The Free Press: United States). According to Nickols, at the heart of change management lies the change problem. That is, for some future state to be realised, some current state needs to be left behind and some structured, organised process for getting from one to the other needs to exist. Change (as per Lewin’s Change Model), has three distinct stages as reflected in Figure 2 . Figure 2: Illustration of the three stages of change (Source: Balogan, J., Hailey, V.H. (1999): Exploring Strategic Change, Prentice-Hall: London). The vision is the bridge between the current and future states and is the force behind transformations. The vision should include the rationale, benefits and personal ramifications of the suggested change. 4. Implementing the Change: Communicating the vision - Managers must be clear in their communications and a formal communications plan is very helpful during a change initiative. Communication competes with ‘’share of mind’’ with many other communications. Weak communications exist, when senior and middle managers do not confer with supervisors or employees about the intended changes (Kendall Consulting, 2003). Communication needs to be assessed by looking at the why, what, how, and when of communicating during the planning and implementation phases of change. Many change interventions fail because companies fail to plan and manage communications, which means that the change programme doesn’t gain the awareness, support, involvement and commitment needed to succeed. Kendall Consulting proposes the use of a Communications Planning Model as shown in Figure 3. Figure 3: Communications Planning Model ( Source: Kendall Consulting Group (2003): Communications: Vital to Successful Organizational Change and Performance , http://www.kendall-consulting.com/comm.html, 18 December, 2003). In summary, change needs to be associated with a sense of urgency and must be propelled by various driving forces that need to be stronger than the restraining forces. Employees need to be motivated to undertake the change by believing that the benefits of the change will outweigh the cost of the change, There exists some practical first steps that make the change more ‘’real’’ to employees. Having a powerful force behind the change involves having a senior management team, which supports and drives the change. The implementation of change needs constant and effective communication. It should be based on a formal communications plan, which motivates employees to undertake the change and which is repeated to enforce the need for change in the minds of employees. The communications plan needs to build a foundation for change. An important characteristic of formal research is that it originates with a question or problem and research is considered as a systematic inquiry, aimed at providing information to solve managerial problems (Cooper and Schindler, 2001). It is important that the research as undertaken is considered credible, in order for the results of the research and this article to be viewed as reliable and valid. The population that was the focus of concern for this research report consisted of approximately 400 bank employees who were directly affected by the change during this alignment process. The report made use of non-probability sampling (judgmental and purposive), in that the researcher selected sample members to conform to some criterion. The sample drawn from the population was 161 employees interviewed in the Branch Banking Unit’s Service Centre. This represented almost 40% of the Service Centre’s structure. The research data was gathered with the use of structured interviews in the form of questionnaires directed at the relevant sample of the population. The data was analysed via the use of a frequency distribution technique, including well-known statistical methods like defining the mean and standard deviation. 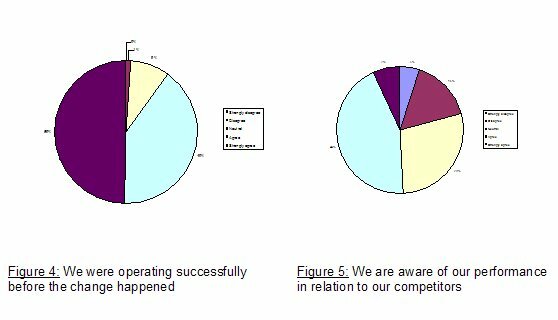 Graphs and tables were produced, containing and illustrating the data analysis process. A factor analysis was then performed to show the reliability of the research data showing that the research may be considered valid and that the findings are credible. The second sub-problem, attempting to determine, whether the change process during the alignment project was successfully implemented with a specific focus on communicating the vision during the change initiative. Let’s evaluate the findings of each problem and sub-problem individually. According to Kotter (1996), if people in an organisation don’t feel the urgency for change, the change process will not have enough momentum. He refers specifically to the complacency levels within an organisation. As mentioned in the literature review above, Kotter suggests that the way to make change initiatives successful is to reduce complacency and to increase the urgency for change. Creating a sense of urgency for change is linked to the planning phase of change. Looking at the change process, it is evident how important the planning element of change is. If planning is not properly done, the whole change process will be negatively affected. Senior management, with the assistance of employees, only have one shot at planning the transformation effectively. No custom made plan exists for any company wanting to make a change (Burnes, 1996). Change is a process, starting off from where the company is today, to where it wants to be in the future. The results of two of the questions as posed to the respondents relating to creating a sense of urgency are provided in Figures 4and 5 below. Most employees (over 90%) agreed and strongly agreed that their previous business units, according to their knowledge and understanding, were operating successfully. Why should we change when things are going well? Higher levels of uncertainty existed when employees were queried regarding the Branch Banking Unit’s competitive position in the industry. This indicates that a significant number of the Service Centre employees may not be ‘’in touch’’ with the situation in the market place. The results of the research shows that most employees seemed to have understood and accepted the reasons for the alignment process and agreed that it was in fact necessary, but ambiguity existed regarding the future success of the business because of alignment. Employees may have understood and accepted the change, because it makes business sense, but the ‘’real’’ driving forces for change, including the vision for the change, strategic objectives of the Group, competitive forces, and customer satisfaction were perhaps not adequately highlighted to employees. This is evident from the levels of uncertainty, and disagreement found as outcomes to the research. It is recommended that staff be made aware of the competitive position of the bank in relation to its competitors. Kotter (1999) refers to examining the market and competitive realities and discussing potential crises and opportunities. Customer and competitive related information must be fed to all staff regularly. Staff need to be sensitive to customer needs and trends and what the competition is doing. This should create a sense of discomfort within them that things always change and that there is always rivalry in the industry with all banks competing for customers. Senior management need to reduce the levels of complacency by continually speaking of changes in the industry and that the absence of a visible crisis should not create comfort in the minds of employees (Thomas, 2003). The driving forces for change, by creating a sense of urgency, will boost the business unit out of complacency and into the future, in order to achieve its vision. Kotter (1996) states that a strong guiding coalition is needed to make change happen successfully, by having a team that is composed of the right people, who have credibility and work well together as a team. The team must work on trust and develop a common goal, which is sensible to the head and appealing to the heart. Relating to creating a strong guiding coalition during the planning process, the outcomes of the research showed that the guiding coalition for the alignment project seemed to have had the correct composition and necessary experience to drive the change. It also showed that most employees did not question the experience of the pivotal figures to make the change a success. Most employees agreed that senior management visibly supported the change process. 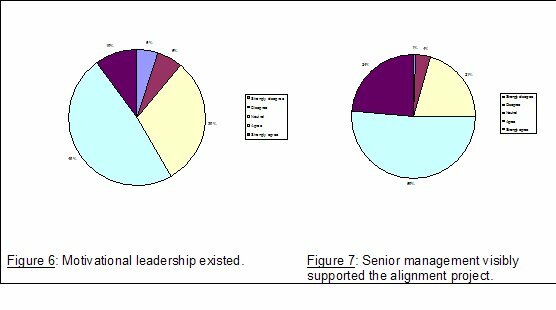 Questions asked were whether senior management motivated employees to participate in the alignment project and whether they visibly supported the change process. See the results in Figures 6 and 7. Building commitment to the change vision (Heskett et al, 1997). Providing recommendations for this aspect, relates to transformational leadership during change. Obtaining trust and credibility from employees (Kotter, 1996) is a long-term process. It is recommended that senior management formulates strategies to bond employees to the vision of the organization and the change interventions that will achieve the vision. The leadership of this Branch Banking unit needed to inspire employees, acting with honesty and integrity ( Caldwell, 2003), whilst ensuring stability and promoting change (Moran and Brightman, 2004). It is recommended that a planned and coordinated change management intervention be developed to focus on strategic change (Caudron, 2003). Middle management needs to also be involved in these initiatives ( Kendall, 2003) with trust existing between all levels of management, which is visibly noticed by all employees. It is also suggested that transformational leadership theory be incorporated in senior management’s development programme. Kotter (1996) defines a vision as a picture of the future with some implicit or explicit commentary on why people should strive to create that future. He states that a good vision during the change process serves three important purposes. Firstly, it clarifies the general direction for change, assisting with simplifying hundreds or thousands of more detailed directions. Thirdly it helps to co-ordinate the actions of different people, in a remarkably fast and efficient way. Kotter states that defining the vision and strategy always takes time and is a difficult process, but should not be neglected, as it forms the basis of the change process. For the outcomes relating to two of the questions asked relating to the vision for change refer Figures 8 and 9. Although no formal vision statement was created and communicated for the alignment project, most employees agreed that senior management stated what the objectives of the project were. Many employees disagreed, and were neutral regarding the unit’s future (where they would be in five years). Very high levels of uncertainty existed with regards to the alignment project’s contribution to the future objectives of the business unit. Providing the objectives of the project does not, in itself, provide employees with an idea of what the future would look like, and how they would be affected by the future state. Senior management did not effectively communicate the vision for the alignment project or the business unit. Although they may possibly have formulated a vision statement and objectives, most employees certainly did not know it. It is the responsibility of leadership to create vision and strategy for change (Kotter, 1996). It is strongly recommended that the business unit formulate a vision for the change process during the planning phase. Employees need to understand what the business unit will look and feel like after the change process. They need to understand how it will affect them and how it fits with the strategic objectives of the bigger Group. It is recommended that management formulate and communicate the master plan for the business unit (Heskett et al, 1997). A specific vision and mission needs to be created and communicated. The gap between the current state and future state needs to be highlighted (Balogan and Hailey, 1999). This gap cannot be shown, if no picture of the future exists. When implementing change, Kotter (1996) advises that a vision for change needs to be communicated to gain the understanding and commitment from the affected people during the change process. He states that failure with the first three elements; as per the abovementioned sub-problems often lead to poor communication of the vision. This indicates an obvious link between all these elements. According to Schuler (2003) his experience consistently teaches that it is almost impossible to over- communicate when leading change. Kotter (1996) recommends clear, simple, memorable, often repeated, consistent communication from multiple sources, modeled by executive behaviour. The communication of the vision could not have been successful without a formal vision for the change, or the newly formed business unit. Most employees agreed that they understood the reasons and necessity of the change and it is no surprise that the communications would reflect this. The problem is that the necessity may only have been highlighted in the initial communications, and not throughout the process. Leadership may have assumed that this aspect only needed to be communicated once or twice during the start of the change. Employees believed that communications were not always consistent as shown by the high level of neutrality in the question regarding consistency. 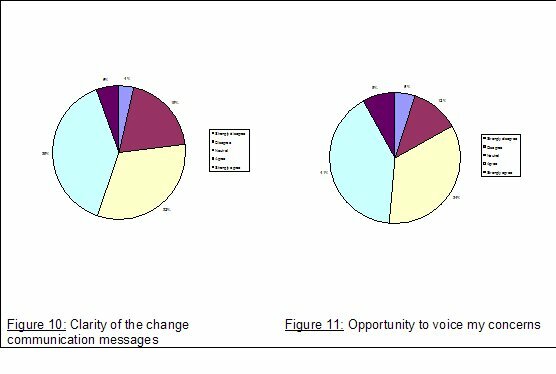 The results of two of the questions posed regarding the communications are provided in Figures 10 and 11. The high level of uncertainty and disagreement relating to the sufficiency of communications in terms of the number of communications, indicate that employees may have felt that with the large number of communication mediums available, not enough communications were sent out and received by employees. Many employees provided neutral answers to the question of them being able to provide their opinion during the process. This outcome correlates to employee’s perceptions that they were not involved during the process. The most concerning part of the communications aspect is the perceived lack of honesty in what was being communicated during the alignment project. Many employees (44%) provided a neutral answer and disagreed that the communications were honest. It is concluded that senior management may have devised a communications plan, but may not have stuck to it. Communications become haphazard with too much reliance placed on the initial communications and the misconception that the communications process would just ‘’come together’’ during the implementation phase. It is recommended that any future communications relating to the alignment project include the vision for the change and the strategic significance thereof. Communications should enhance the driving forces for change and reduce all retraining forces (Heskett et al, 1997). Senior management needs to review their communications plan and strategies and need to measure the effectiveness thereof (Kendall Consulting, 2003). The communications plan needs to include the context of the change taking place. Future change interventions need to be honest, open and take into account the audience by being simple and straightforward (Wallington, 2000). Communications need to be frequent and need to motivate more employees to participate in the process by creating enthusiasm (Canterucci, 2003). The communications should also include not only the why and what of the change process, but also the how aspect via consistent and repeated messages, eliciting involvement from all employees. How do you successfully manage the change process associated with the merger of two business units? Firstly, you need to communicate the strategic significance of the change to all employees, with the use of multiple mediums, stating the reasons and necessity of the change. Change is associated with competitive realities in the market place, and employees need to be aware of these realities. Secondly, leaders need to be aware of the principles of change management and apply these principles in the form of transformational leadership. Leaders need to create a vision of the future, communicate the vision, build commitment to the vision and model the vision. This vision for the change process must be consistent with the vision and strategic objectives of the company and the wider group. Andre Peters is currently employed in the financial services sector in the corporate division of one of the large banks in South Africa where he manages strategic marketing projects and the implementation of new solutions. He has three academic qualifications, including a B Com (Law), Honours in Strategic Management and an MBA. He also holds a diploma in Advanced Project Management. On the project management side, he has been fortunate enough to work on various major projects, which also provided him with facilitation and consultation experience. He has also worked as a business analysis and has partaken in large process re-design projects. His work experience includes sales management, marketing, process reengineering and administration. He also served as Manager: Transformation, looking after operational change processes in a retail bank. Balogan, J., Hailey, V.H. (1999): Exploring Strategic Change, London: Prentice-Hall. Pitman.Caldwell, R. (2003): ‘’Change leaders and change managers: different or complementary’’, Leadership and Organizational Development Journal, Volume 24, Issue 5, p 285-293. Canterucci, J. 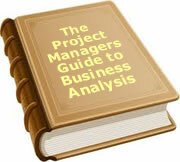 (2003): ‘’Change Project Management – The Next Steps’’,, 12 December 2003. Carrow, J.C. (2001): ‘’The Change Model That Jack Built - A program developed at GE has proved its value in other companies’’, 12 January 2004. Caudron, S. (2003): ‘’Taking Charge of Change’’, Business Finance Magazine, 21 November 2003.
Cooper, D.R., Schindler, P.S. (2001): Business Research Methods, Seventh Edition, United States: Mc Graw-Hill. Heskett, J.L., Sasser, W.E., Schlesinger, L.A. (1997): The Service Profit Chain, How Leading Companies Link Profit and Growth To Loyalty, Satisfaction, and Value, United States : The Free Press. Holder, B.J. (2003): ‘’Why Change Efforts Fail’’, l, 10 December 2003. Jick, T. D. (1991): ‘’Implementing Change’’, Harvard Business School Case, N9, p 491-114, http:www://harvardbusinessonline.hbsp.harvard.html, 24 November 2003. Kotter, J.P. (1996): Leading Change, United States: Harvard Business School Press. Leedy, P.D. (1997): Practical Research - Planning And Design, Sixth Edition, United States: Prentice-Hall. McKee, T.W. (1998): ‘’It Isn’t Change That Does You In, It’s the Transitions’’, Advantage Point System Inc, http://www.managerwise.com/cgi-bin/frames.cgi?page=kbank//kb42.html, 20 October 2003. McShane, S.L., Von Glinlow, M.A. (2000): Organizational Behaviour : Emerging realities for the workplace revolution, United States: Mc Graw-Hill. Moran, J.W., Brightman, B.K. (2004): ‘’Leading Organizational Change’’, MCB University Press, http://www.emerald-library.com/ft.html, 10 February 2004. Nickols, F. (1990): ‘’Change Management 101: A Primer’’, http://www.home.att.net/~nickols/change.html, 15 September 2002. Riches, A. (2003): ‘’You must be consistent if you want to change’’, Anne Riches articles, http://www.anneriches.com.au/article-ct5.html, 14 December 2003. Schuler, A.J. (2003): ‘’Planning Change Management Communication’’l, 10 December 2003. Senior, B. (1997): Organizational Change , Great Britain : Pitman Publishing. Simmerman, S.J. (1999): ‘’Teaching the Caterpillar to Fly’’, http://www.squarewheels.com/mainpage/swsmain.html, 19 December 2003. To date, 60 people have rated this article. The average rating is 3.85 - Add your rating. Just select a rating and click the button. No other information required.